With the revival in domestic economic growth and favourable export prospects, the metal space has turned attractive over the past few months. In this light, Hindustan Zinc, a leading producer of zinc and silver appears well-placed to cater to the demand for these metals. The ongoing trade ‘war’ between the US and China could impact metal prices in the short term. But the company’s near monoply in the domestic market and its ability to hedge prices to protect realisations should assuage investor concerns. Its standing as one of the largest producers of zinc in the world, low production cost and a substantial reserve base are positives for the stock. 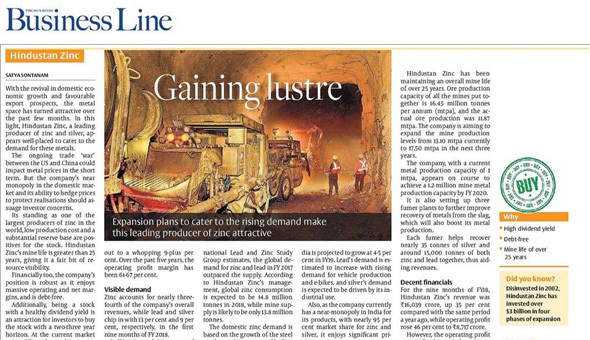 Hindustan Zinc’s mine life is greater than 25 years, giving it a fair bit of resource visibility. Financially too, the company’s position is robust as it enjoys massive operating and net margins, and is debt-free. Additionally, being a stock with a healthy dividend yield is an attraction for investors to buy the stock with a two-three year horizon. At the current market price of ₹314, the stock is reasonably valued at about 13 times its trailing 12-month earnings, which is a tad higher than 11 times, the average for the past three years. Going by Hindustan Zinc’s dividend pay-out over the past couple of years, the yield works out to a whopping 9-plus per cent. Over the past five years, the operating profit margin has been 61-67 per cent. Zinc accounts for nearly three-fourth of the company’s overall revenues, while lead and silver chip in with 13 per cent and 9 per cent, respectively, in the first nine months of FY 2018. In FY 2017, nearly 75 per cent of the company’s revenues were derived from the domestic market and the balance 25 per cent from exports, mostly to Asian markets. Thus, the company has a good blend of local and overseas markets to cater to. As per the International Lead & Zinc Study Group estimates, the global demand for zinc and lead in FY 2017 outpaced the supply. According to Hindustan Zinc’s management, global zinc consumption is expected to be 14.8 million tonnes in 2018, while mine supply is likely to be only 13.8 million tonnes. The domestic zinc demand is based on the growth of the steel market, as 70 per cent of Indian zinc consumption is in the galvanising sector. 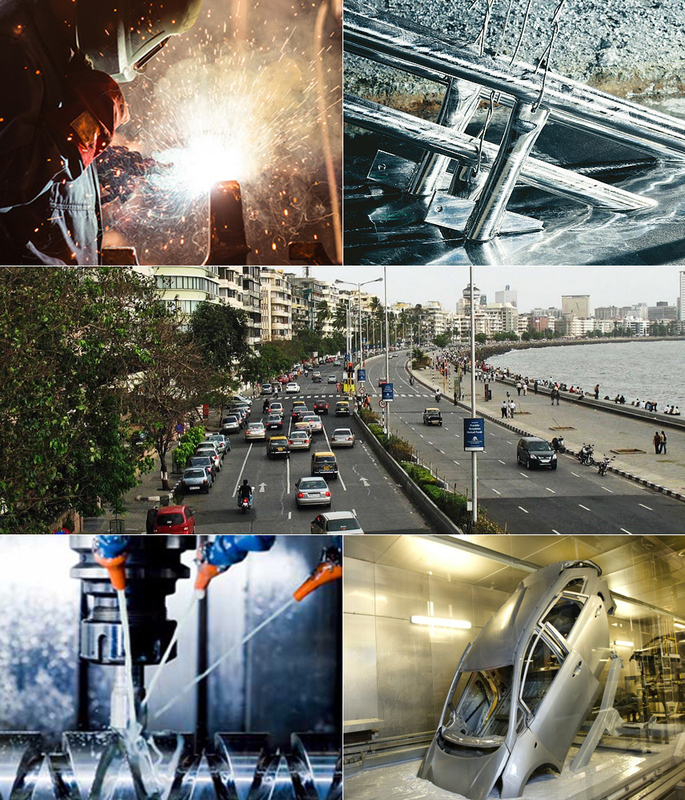 And steel growth in India is driven by consumption in the auto and construction sectors. Government’s measures (such as minimum import prices) help to protect the Indian steel market. Zinc demand in India is projected to grow at 4-5 per cent in FY19. Lead’s demand is estimated to increase with rising demand for vehicle production and e-bikes, and silver’s demand is expected to be driven by its industrial use. Also, as the company currently has a near-monopoly in India for its products, with nearly 95 per cent market share for zinc and silver, it enjoys significant pricing power. As Hindustan Zinc’s sales of zinc and lead are linked to the London Metal Exchange (LME) prices, the movement in commodity prices is a risk to the company’s realisations. The company hedges sales to realise LME prices. Hindustan Zinc has been maintaining an overall mine life of over 25 years. Ore production capacity of all the mines put together is 16.45 million tonnes per annum (mtpa), and the actual ore production was 11.87 mtpa. The company is aiming to expand the mine production levels from 13.10 mtpa currently to 17.50 mtpa in the next three years. The company, with a current metal production capacity of 1 mtpa, appears on course to achieve a 1.2 million mine metal production capacity by FY 2020. It is also setting up three fumer plants to further improve recovery of metals from the slag, which will also boost its metal production. Each fumer helps to recover nearly 35 tonnes of silver and around 15,000 tonnes of both zinc and lead together, thus aiding revenues. For the nine months of FY18, Hindustan Zinc’s revenue was ₹16,039 crore, up 35 per cent compared with the same period a year ago, while operating profit rose 46 per cent to ₹8,717 crore. However, the operating profit margin for this period was 54 per cent, a tad lower than in the same period the previous year due to higher met coke and coal prices which are the key raw materials. Future linkages with Coal India and other measures will reduce costs, according to the management.